Espresso Games has forged an impressive reputation in the online gaming industry with its effective combination of decades of experience and the latest in gaming technology and strategy. The company’s commitment to providing outstanding products and customer care has seen it strike up relationship with some of the major players in the industry and it now operates from offices and locations worldwide. Espresso Games is aptly named because the brand is like a shot of energy! Just like a great espresso, it is chic, modern, and enjoyed by many! Click here to read more. Based in London, Espresso Games has expanded to offices all over the world. An office in the bustling city of Buenos Aires handles South American clientele, while another office in glamorous Miami deals with business in Reno, Las Vegas, Atlantic City and New Jersey. With a genuine global appeal, Espresso Games has been widely recognised and praised for championing innovation in the industry. The company has a strong emphasis on adapting to new trends and directions in the gaming market. 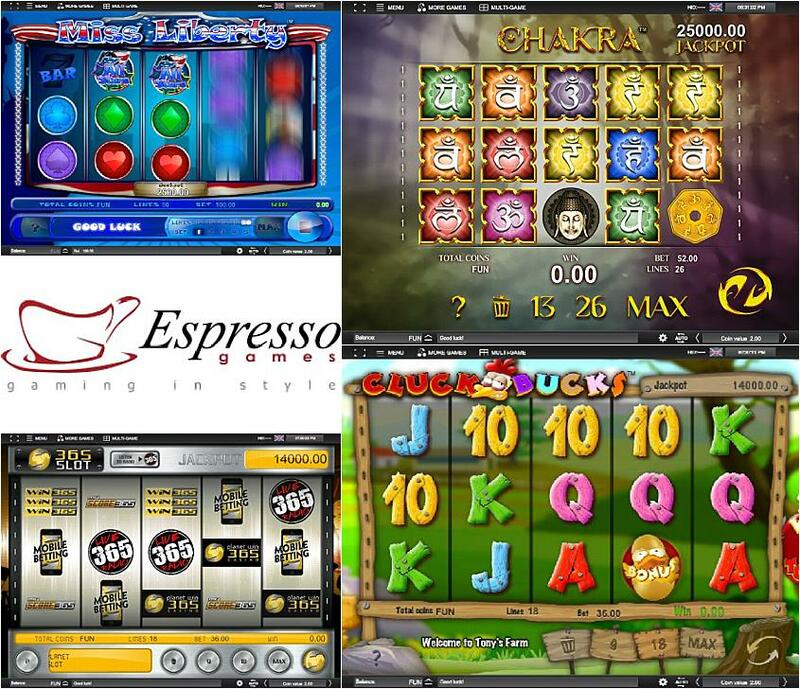 The Espresso Games’ in-house platform allows integration with a wide range of businesses and platforms, ranging from bingo rooms, casinos, and social gaming networks. With a flexible approach combining experience with modernity, Espresso Games has been able to adapt to the latest technological and gaming trends and continues to evolve. The team at Espresso Games is passionate about creating a great gaming experience. Customer satisfaction, fairness, and complete transparency are at the forefront of the company’s commitment. Espresso Games is acutely aware of the high expectations of quality and adherence to regulations and codes of conduct within the industry. The company is committed to evolving with the market and that includes participating in all levels of player protection measures and controls. Espresso Games is proud to be RNG itech labs certified, meaning that its games have been officially and rigorously certified as random and fair. Players, operators, and all affiliates can champion the games with complete confidence that they are associated with a quality product. The value of partnerships and collaboration in business is at the heart of the Espresso Games philosophy. Online gaming providers have been consistently impressed by the company’s auxiliary technology provision and system architecture that was specifically designed with cross-product integration in mind. That, in itself, is testament to the firm’s commitment to collaboration, expansion, and mutually beneficial partnerships. The Espresso Games team has a broad range of experience and over 20 years’ experience in the land-based and online gaming industries. In just a few short years, the management of Espresso Games has been able create a vibrant, stylish company committed to a high quality gaming experience, attracting attention from some of the industry’s biggest names. Their emphasis on fairness and integrity is reflected in their adherence to strict quality control measures, and their passion for collaboration is facilitated by a system architecture that easily allows cross-product integration. With innovative solutions and an eclectic roster of gaming titles, Espresso Games is rapidly rising to the very forefront of the online gaming industry.